McLain strikingly depicts Martha Gellhorn’s burgeoning career as a writer and war correspondent during the years of her affair with and marriage to Ernest Hemingway. The narrative begins when Gellhorn, who has garnered national recognition for her field reporting on the Great Depression, meets Hemingway and travels with him to cover the Spanish Civil War at his suggestion. The war both horrifies and inspires her to continue writing, particularly one traumatic moment when she witnesses a child being killed by a mortar. While in Spain, Gellhorn and Hemingway become romantically involved and then move to Cuba, set up house, and launch into a productive period of writing and publishing. Things go well for a few years, but Hemingway’s neediness and jealousy eventually poisons their happiness and forces Gellhorn to choose between her own career and indulging his desire for a devoted wife. Realizing her true passion comes from on-the-ground reporting, Gellhorn decides to cover D-Day by leaving Hemingway and stowing away on the first hospital ship to land at Normandy, wading ashore to become the “first journalist, male or female, to make it there and report back.” Gellhorn emerges as a fierce trailblazer every bit Hemingway’s equal in this thrilling book. I read “A Paris Wife” a few years ago about Wife #1, Hadley and now wondering if there is a book about Pauline on the horizon. I loved Martha’s independent spirit and ability to make things happen so she could create a great career for herself. Somehow I don’t think she cared for Hemingway all that much but instead liked the idea of being in love with him. I never was a big Hemingway fan but can appreciate his writing. Another recent book I’ve read was “The Ambulance Drivers” about his friendship with John Dos Passos. 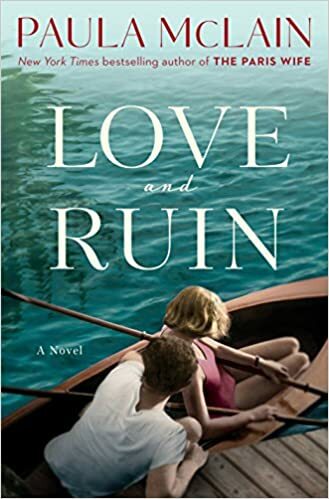 Love and Ruin was a good read by Paula McLain. In 1937 Martha went to Madrid to find out about the Spanish Civil War. Martha finds herself falling in love with Ernest Hemingway. I loved reading about how they fell in love and the result of said love.